Rudy Giuliani, President Donald Trump's personal lawyer, in photo from May 2018 in Washington, DC. 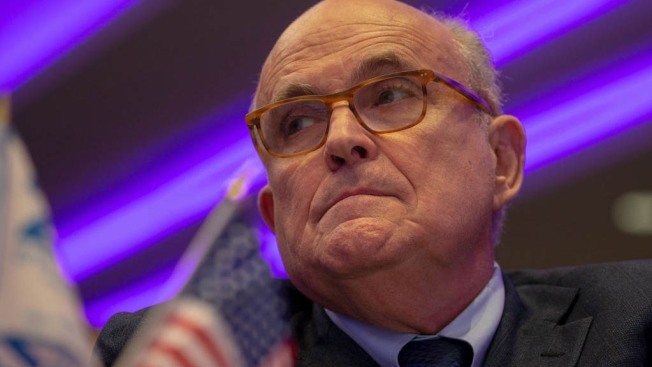 President Donald Trump's personal attorney Rudy Giuliani said Sunday that plans to build a Trump Tower in Moscow remained an “active proposal” as late as November of 2016, months later than known previously. Giuliani, appearing on NBC's "Meet the Press," said that the president has told him he can “remember having conversations” with his former lawyer, Michael Cohen, about the project well into 2016. Cohen has pleaded guilty to lying to Congress about the timeline of his involvement in the proposal, admitting that he worked on it through June of 2016. He initially said it ended at the beginning of that year. “It's our understanding that they went on throughout 2016," Giuliani said of the discussions, adding that there "weren't a lot of them, but there were conversations. Can't be sure of the exact date," he said, referring to written questions Trump and his lawyers have answered from special counsel Robert Mueller's office. Democratic Sen. Mark Warner, vice chairman of the Senate Intelligence Committee, said that it was "big news" to him that the talks were continuing through October or November 2016 and said he thought it "a relevant fact for voters to know."